2015-02-04 Software adapted to BT-module. Ready! 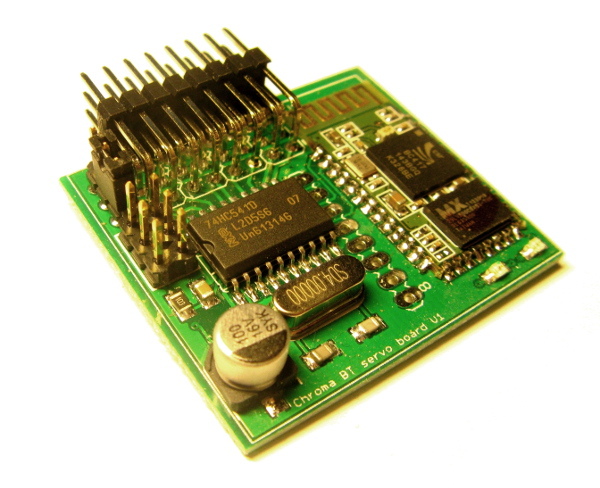 It's a small board that connects to anything that can talk Bluetooth SPP (Serial Port Profile) and allows you to control up to eight RC servos (or ESCs) via serial commands. The commands are simple ASCII. Of course this SW will also be open source. The serial ASCII protocol is the same as for the USB and RPiSB v2 and v3 boards, with additions for bluetooth specific settings, like setting bluetooth name and pin. It also features a selectable fail safe mode if connection is lost, servos are moved to a predetermined position. The output is buffred and made 5V by a buffer IC. If you are into AVR-programming you can reprogram the little MCU on the BT Servo board and make the card do whatever you like. Maybe read 6 temperature sensors and send the values as ASCII on the bluetooth serial port? The card also has a 8 pin connector (unmounted) that exposes 6 GPIO-pins of the ATmega8 CPU, +3.3V and GND. There are support to use them as as digital output controlled via a serial command. 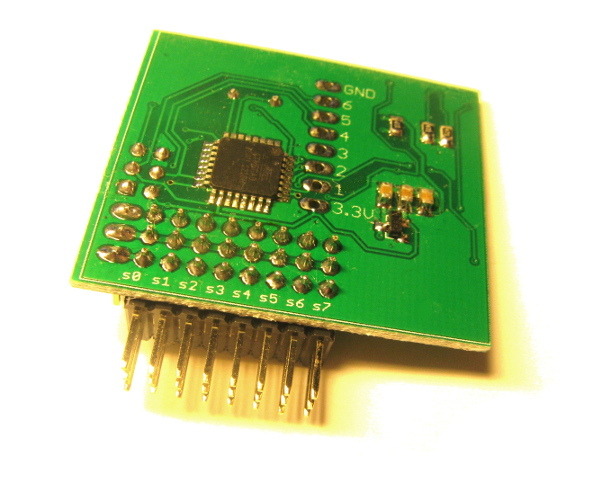 If you want to make your own firmware the pins is also the ATmega8s I2C lines (2 pins) and SPI (4 pins). Postage to Sweden is $1, rest of the world $2.